Not all blueberries are created equal. It’s a fact that many consumers freely take for granted without much afterthought, but it’s one that also drives a lot of hard work and research done by many Canadian farmers and processors doing business with the Quebec Wild Blueberries Inc. co-operative. 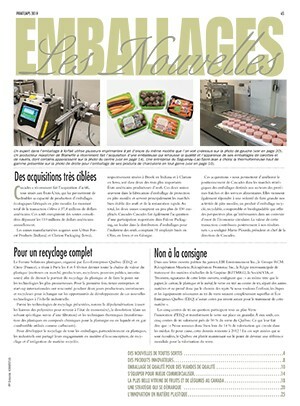 As a key commercial agent for local Quebec wild blueberry farmers and processors, Quebec Wild Blueberries insists on maintaining a high level of quality excellence throughout the value chain to ensure its international clientele reaps all the sought-after health benefits of the fruit, as widely noted in many health studies, as well as to enjoy its uniquely sweet taste profile well after the harvest. Unlike cultivated blueberries produced and packed in mass commercial quantities, wild blueberries naturally pack more flavor into their blue spheres, while also producing a higher content of anthocyanin—a strong antioxidant that helps kill free radicals in the human body. 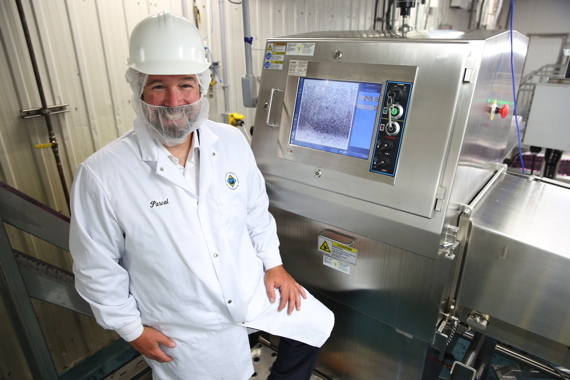 Quebec Wild Blueberries director of operations Pascal Hudon is very impressed with the high-accuracy product inspection delivered by the new Pack 400 HC X-Ray system, made by Eagle Product Inspection and distributed in Canada by PLAN Automation, at the Saint-Bruno facility. As such, anthocyanin is widely lauded as an effective natural aid for preventing cell and tissue damage that could potentially lead to cellular disease and illness. According to a recent study conducted by Dr. Wilhelmina Kalt of Agriculture and Agri-Food Canada, “The blue pigment that is found in wild blueberry skin contains a high concentration of anthocyanins that have property to destroy free radicals in the human body, which are responsible for diseases like cholesterol, diabetes, cancer, etc. Other research even suggests additional berry health attributes in helping to prevent early onset of memory-related diseases such as Parkinson’s and Alzheimer’s dementia. While many such claims remain to be validated scientifically, there is nothing doubtful about the high Vitamin C content and the awesome taste of Quebec wild blueberries grown across the province for hundreds of years. Over time, wild blueberries have steadily become a staple ingredient for chefs and recipes all over the world—retailing far and wide in fresh, frozen, dehydrated and concentrated formats and formulations. Widely used in beverage production and canned products, it is also a popular natural ingredient in a wide range of desserts, baked goods and commonplace breakfast fare like cereal, yogurt, pancakes, waffles, muffins, jams, etc. 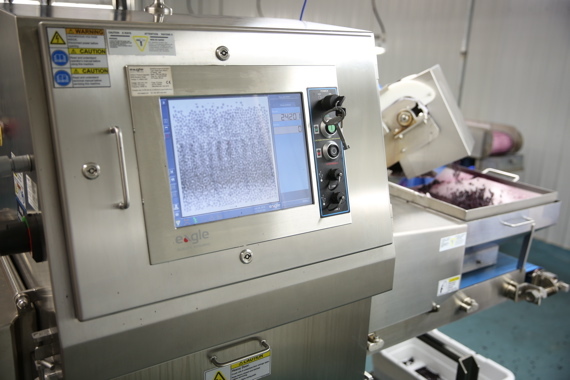 The Pack 400 HC X-Ray product inspection system manufactured by Eagle Product Inspection was selected in part for its rugged ability to work in the -30°C environment. Founded in 1984 in the heart of the Lac Saint-Jean region—about 200 kilometers north of Quebec City—the Quebec Wild Blueberries enterprise enjoys enviable proximity to some of the best-tasting blueberries anywhere in the world, according to many food authorities. With the product now reaching customers in over 30 countries—including the U.S., China, Japan, Australia, France, Belgium, South Korea, Italy, Spain, Germany, Switzerland, U.K., The Netherlands, Israel and Mexico—wild blueberry farming today ranks as the second-largest agricultural activity in the Lac Saint-Jean region after the dairy sector. According to Quebec Wild Blueberries director of operations Pascal Hudon, the co-op’s growers annually collect a combined total of 65 million pounds of wild blueberries from the designated picking areas across the region—all within a very tight time-frame between August and mid-September. Local growers supply Quebec Wild Blueberries with an annual harvest of 65 million pounds of wild blueberries for shipment to over 30 countries. During the month of June, wild blueberry fields turn white as the plant’s flowers bloom, and then into a sea of blue as the fruit ripens through early the beginning of August. That’s when the wild blueberries—visibly smaller than their cultivated cousins—are ready to be harvested. As Hudon explains, the Quebec Wild Blueberries farm operators use special rakes to collect the organic wild blueberries in the forested areas, whereas the nonorganic wild blueberries are picked in the fields using mechanical or semi-mechanical picking methods. 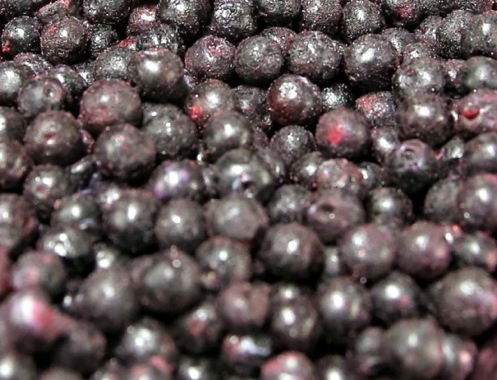 Once harvested, the tiny fruit are immediately shipped to one of the company’s four nearby processing plants in Saint-Bruno, Saint-Félicien, Dolbeau or Newport, where they are graded for size, individually quick-frozen (IQF) and stored in a clockwork-like process that keeps Quebec Wild Blueberries sufficiently stocked to be able to ship its product to customers throughout the year. 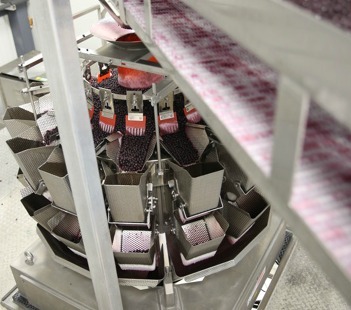 A food-grade conveyor transfers the bulk loose wild blueberries into the multihead, fully-automatic Ishida weighscales at the Saint-Bruno facility. 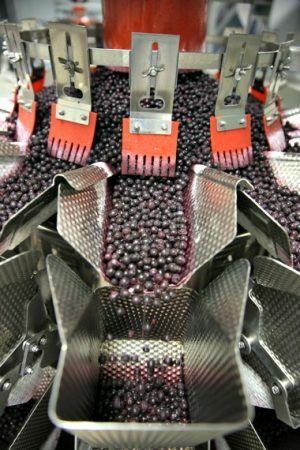 “The wild blueberries are picked, sorted, packaged and frozen at a steady pace for about 35 to 40 days,” Hudon explains. “As soon as the fruit is picked, we transport it to one of our four ice plants, where workers place them into containers of differing sizes, depending on the precise specifications of each of our customers. “Doing it this way ensures that we maintain all the high-quality aspects of the wild blueberries that our customers expect,” Hudon states. For international customers, Hudon explains, the blueberries are maintained in their frozen state through shipping to make sure the bulk product arrives at the clients’ processing facilities in perfect condition. Boasting both ISO 9001:2000 quality management and HACCP (Hazard Analysis Control Critical Points) food safety certifications, the company’s facilities maintain in-house laboratories, a biological research department, and well-qualified technicians to help ensure optimal product quality control and safety, backed up by strategic investment in leading-edge quality control technologies. 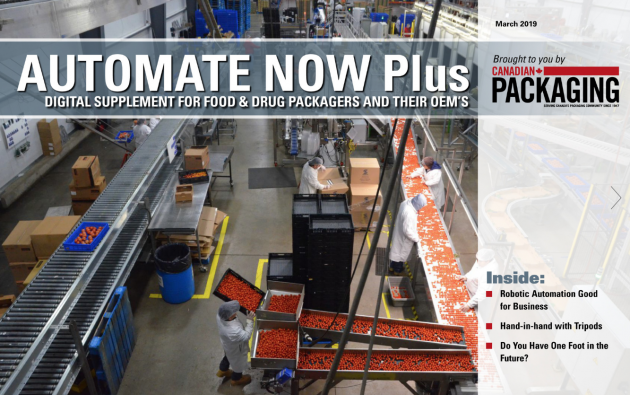 In May of 2015, for example, the Saint-Bruno facility installed a brand new model Pack 400 HC X-Ray product inspection system, manufactured by Eagle Product Inspection and distributed in Canada by the Orangeville, Ont.-based automated packaging systems integrator PLAN Automation. a fully-automatic Ishida weighscale, and a Vegatronic series vertical bagger manufactured by ILAPAK, both supplied by Techno Pak. 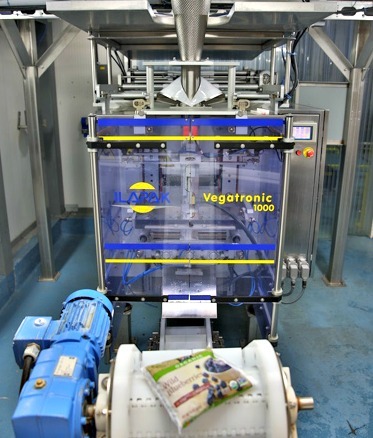 The Vegatronic 1000 model VFFS intermittent bagger is ideal for packaging loose products, including frozen produce such as wild blueberries, in plastic bags. As Hudon relates, the plant’s management did extensive market research and a lot of legwork before selecting the Pack 400 HC X-Ray detector. “We visited a number of industrial trade shows and then went into many factories that utilized a metal detection and/or X-Ray system, so that we could see how each worked in real-life situations,” Hudon recalls. “After members of our team organized their own thoughts, we sat down together and discussed our analysis until it was crystal clear which equipment best met our needs,” says Hudson. interlocked hinged louvers that are easily lifted to allow access to the conveyor—eliminating the need to dismantle traditional heavy louvers to clean inside the machine—and easy belt removal. The Pack 400 HC X-Ray system provides 400-mm of detection coverage at the belt, according to Eagle Product Inspection, and is capable of high-speed imaging of up to 60 meters (200 feet) per minute. 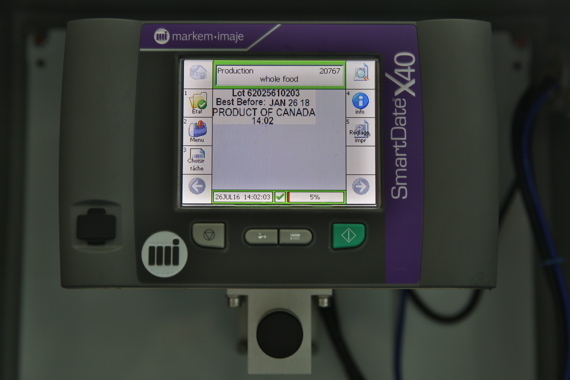 The SmartDate X40 thermal-transfer printer from Markem-Imaje is designed for maximum uptime and reliable performance even in harsh environments. 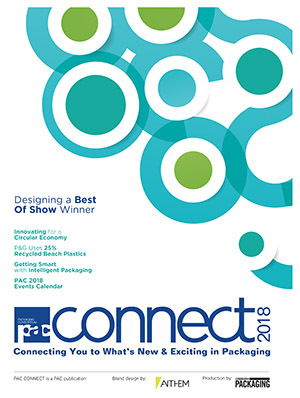 “The overall system design and the ease of cleaning ultimately convinced us to purchase the Pack 400 HC X-Ray system,” says Hudon. 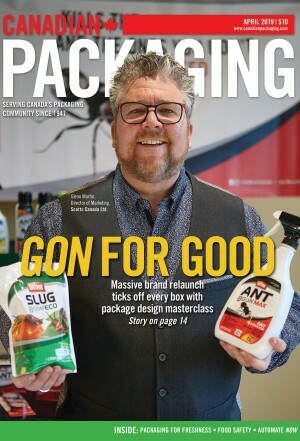 “It is refreshingly easy to use and easy to clean: unlike some similar products from other manufacturers that almost require a university degree to maintain on a daily basis,” he notes. “Because we work around the clock, five-days-a-week, cleaning our facility and equipment is a daily challenge,” says Hudon, complimenting the Eagle X-Ray detector’s ability to withstand the Saint-Bruno’s plant’s challenging cold-room environment. 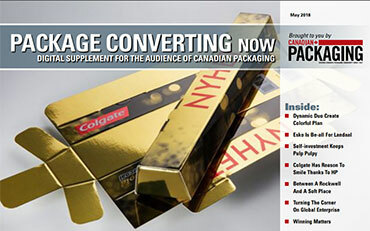 citing the availability of PLAN Automation’s Quebec office in Boucherville as another deciding factor. achieved by the Pack 400 HC system at the Saint-Bruno plant, that we are currently in the process of installing a second such unit at our Saint-Félicien facility.